Many individuals suffer symptoms of sensitive teeth which typically consist of discomfort or pain while eating, drinking, and breathing. 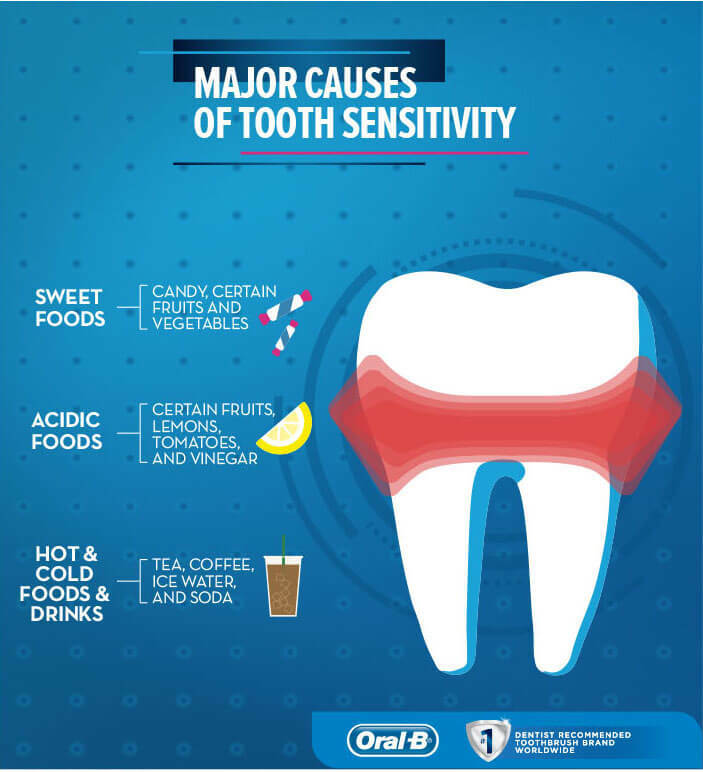 Causes of sensitive teeth can vary from deteriorated tooth enamel to unprotected tooth roots. If you are suffering from sensitive teeth and wondering how you can prevent this condition, continue reading for the 10 common causes of sensitive teeth as well as suggestions on how to avoid or diminish sensitive teeth. Keeping your teeth clean and free of plaque is fundamental to your oral health. However, using a hard bristle brush or brushing teeth harshly can wear down the enamel and be one of the top causes of sensitive teeth. Once this protective coating is damaged or worn down entirely, the dentin underneath is exposed. This tissue inside the tooth is highly sensitive to stimuli. Using a softer bristle brush and brushing less vigorously is your best course. If you have a chipped or cracked tooth and notice pain resonating from that particular tooth, this is a severe condition and one of the top causes of sensitive teeth. The discomfort experienced is most likely resulting from plaque and food debris seeping into your teeth, accessing the pulp, and causing an infection. Extraction, a root canal, or another dental procedure will have to be done to treat the infection and thereby alleviate the pain. In some instances, a cavity causes sensitive teeth. Much like cracks or chips in a tooth, a cavity also provides an opening to deep layers of the tooth. Poor oral hygiene and regular consumption of sugary foods and drinks will lead to sensitive teeth. The purpose of a filling is to repair cavities and openings in the teeth. However, over time, these fillings can wear down. As they do, an entrance to the tooth is once again revealed. Relieve sensitive teeth from this cause with a secure filling. People who grind their teeth will wear them down, resulting in extreme discomfort and causes tooth sensitivity. Ask your dentist about bruxism. A mouthguard might be suggested for your sensitive teeth. Related Article: Are You Experiencing Jaw Pain? You could have TMJ! A typical cause of sensitive teeth is the persistent consumption of acidic foods or drinks. The chemicals contained in these items attack the enamel of the teeth causing it to wear down and lose its strength. Decreasing the consumption of these items (such as wine, soda, coffee, and some fruits) can reduce tooth sensitivity. Gum disease results from poor oral hygiene habits. With severe plaque build-up, bacteria can collect heavily on the gums. It causes sore and bleeding gums and discomfort while chewing. More severely, it can attack the bone of the teeth often resulting in deterioration, pain, and eventually tooth loss. Gingivitis is the preceding stage of gum disease and occurs when plaque builds up on the teeth and along the gum line. It causes red, swollen, tender gums. If left untreated, gingivitis leads to gum recession, that will expose the root of the teeth. This state of vulnerability leads to very sensitive teeth. Using mouthwash is a good addition to your routine of flossing and brushing. However, when used in excess, it can rank on the list of causes of sensitive teeth. Some mouthwashes contain alcohol, which can wear down the enamel. Consider using a milder mouthwash, without alcohol to limit enamel erosion. Dental procedures are often performed to correct an existing issue. However, they may result in sensitive teeth immediately afterward. This discomfort should only last a short period. If you notice the pain continues after the estimated recovery period, contact your dentist about your sensitive teeth. If you have sensitive teeth, visit GPS Dental. Our dental professionals can identify the underlying causes of your tooth pain. For more information on our services, how we can help you, or to book your next appointment, contact us.